Under perfect weather conditions, fast times were plentiful at the class championships on Saturday. In the Class A boys' meet, won by La Salle Academy, Ram junior D.J. Principe led six runners under the 16-minute barrier for the 5K course at Ponaganset. Principe finished with an outstanding time of 15 minutes, 19.98 seconds. Senior teammate Matt Bouthillette was second at 15:28.72. 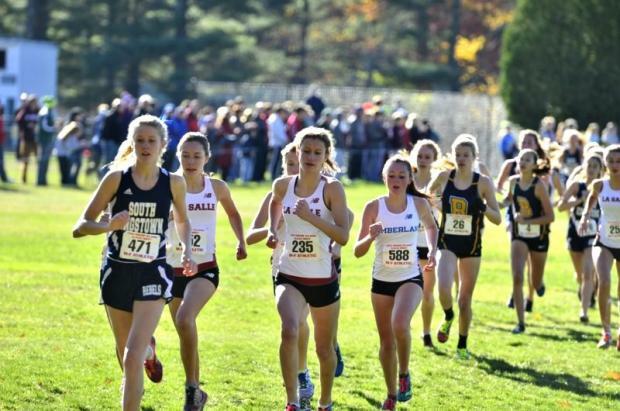 In the girls' Class A race, also captured by La Salle, South Kingstown sophomore Ellie Lawler outdistanced Ram senior Eliza Rego with a winning time of 17:50.59. Rego snared runner-up honors at 18:01.51. Besides LaSalle, also winning team titles were Barrington (Class B boys), East Greenwich (Class C boys and girls) and Bay View (Class B girls). Classical's Joe Murphy (16:29.83) and Mount St. Charles' C.J. Berg (16:18.42) took the respective Class B and Class C individual boys' titles and Westerly's Randi Burr (18:56.72) and Narragansett's Marissa McPhillips (18:48.02) claimed the girls' crowns in Class B and Class C.
For Photos and Results, click here. More coverage coming soon.